You've got to watch the amount of sugar in the flavored ones. Sometimes you can find 20+ grams of sugar in just one of the tantalizing treats. Always watch the label and try to find a lower sugar per container yogurt alternative (under 20 grams). You can easily knock out your daily allotment of sugar with sneaky sugar-filled snacks. I'm sure this is something you already know, but I gotta throw it out there because I care about you. They will not have as much protein as classic Greek yogurt. Unfortunately, there isn't as much protein found naturally in lactose-free yogurt substitutes as traditional Greek yogurt. However, we can come pretty darn close with one of my substitutes listed below. No matter how close, lactose-free yogurt substitutes can't be JUST LIKE yogurt. Simple as that. A few of these come very close to the same taste and texture, but at the end of the day, don't expect them to be the exact same as traditional yogurt. They just can't be! We won't be hurting for flavor or nutrition benefit, though. My 3 suggestions have their winning points. I have to say, I LOVE this snack yogurt substitute for many reasons. First of all, in my opinion, this yogurt is the most similar to classic dairy yogurt. It's consistency and flavor are extremely similar to the original. I love Kit Hill because as it says on the label, they really are artisan almond milk yogurts. The vanilla-flavored one is so creamy & delicious with tiny specs of vanilla bean. HOLY YUM. This is a fantastic yogurt substitute for your mid-morning snack that would be perfect by itself or adding in granola, fruit, or nuts (I love walnuts + blueberries mixed in!). Since this is an artisan-style yogurt, it tends to run a tad more expensive than perhaps other lactose-free yogurt substitutes. However, I have bought it on sale at Fresh Market before and it wasn't any more expensive than the rest of the yogurts. The only drawback to being addicted to this brand is that sometimes it can be difficult to find. Once I went on an intense easter-egg-hunting-style search for this tasty treat around town. Ha! However, I was able to find some at Whole Foods. You'll have the most luck buying this from places like Whole Foods, Fresh Market, and any other "fine foods" grocery retail store. :) Trust me, it's worth it my friend. Availability: If you live in a metropolitan area with stores like Whole Foods + Fresh Market, you're set! If you're in a rural area, you may have a harder time finding. Health Benefits: Low in calories ( 180 in the small container pictured above) and a little punch of protein (5g). Alright, in my opinion, this yogurt substitute is the least like traditional yogurt. It makes sense though, because coconut milk is so much different than other milks. However, I really like the taste of this yogurt. [Hint: you must like the flavor of coconut to like this yogurt substitute. If you're not a fan of coconut flavor, skip this one.] I really love the naturally-tropical taste of this yogurt. I can eat this yogurt plain, but it would be extra-awesome with some fresh pineapple chunks, coconut shreds, or your favorite granola. Mmm mm! If you are enjoying this lactose-free + certified vegan yogurt substitute, swap it out for an indulgent dessert because there's a good amount of sugar in most coconut milk yogurts. I saved my favorite for last - KEFIR! Yes, this brand of kefir is made from cow's milk, so it is not vegan. However, it is 99% lactose-free. Take it from someone who is VERY sensitive to lactose, especially in traditional yogurts, that I never have tummy trouble after eating Kefir. If you need a refresher of what Kefir is and how it's made, check out this helpful in-depth article. To summarize, it's a fermented substance made from gelatinous "grain" that contain a bacteria/yeast mixture clumped together with casein and complex sugars. The beneficial yeast and bacteria in Kefir provide an enzyme which consumes most of the lactose left after the culturing process called lactase. I love to buy plain Kefir then add my own amounts of vanilla and sweetening like honey, agave, or a pinch of stevia. This is probably my top yogurt substitute choice to mix in granola, chia seeds, or fresh fruit. My go-to mid-morning or afternoon snack is about 1/4 cup of plain Kefir mixed with 1 tsp vanilla extract, a pinch of stevia, 1 tbsp of chia seeds mixed together then topped with fresh blackberries and my favorite granola. I absolutely love the dose of excellent probiotics that Kefir delivers and again, my tummy only feels fantastic after eating it. I also use Kefir in place of other ingredients like sour cream or (appropriately) yogurt. :) There are other varieties of Kefir such as goat, rice milk, and other cow's milk alternatives out there. However, their taste, health benefits, and price point vary from what I'm reviewing here. Texture: Creamy, but runnier/thinner than regular yogurt. I like to add chia seeds to make thicker. Availability: I've found Kefir everywhere. Almost all grocery stores and even some convenience stores carry now. Health Benefits: SO many probiotic benefits (insert high five emoji here) for a healthy gut. Low in calories (110 per cup in pictured above), decent in sugar (12 g per cup), but protein in here is almost as much as the infamous Greek yogurt (11g per cup!). Overall, if I were going to keep a pre-flavored yogurt on-hand to grab n' go for a mid-morning work snack, I'd choose the almond milk yogurt substitute. If I wanted an indulgent tropical-tasting treat I'd select the coconut yogurt. For my breakfast granola and one I always keep around the house to sub for other lactose ingredients in recipes, Kefir would be the winner. 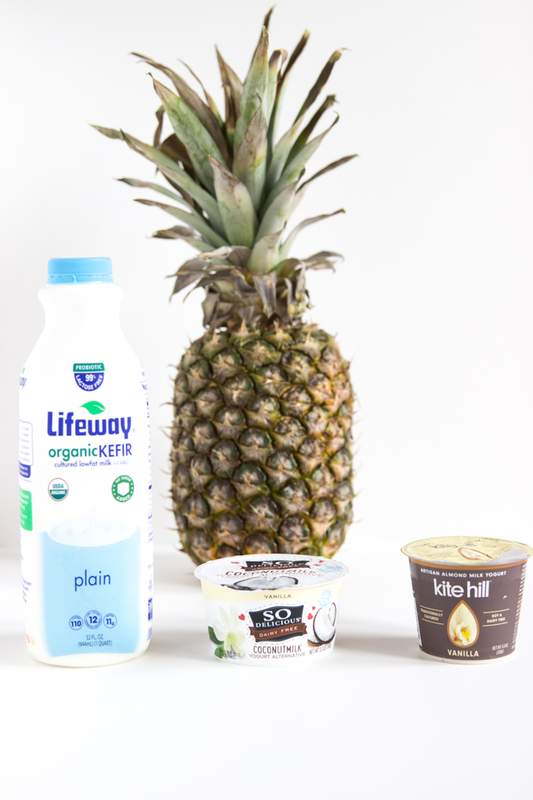 I hope these 3 yogurt substitute ideas will help you or a lactose-free snacking friend! How do you all feel about yogurt substitutes? Have you tried any of these I've mentioned or do you have other favorites? Comment below and let me know! Here's to tasty yogurt substitutes that keep us lactose-sensitive folks from having major FOMO... Cheers!